Understanding the genetic impacts of forest management practices is crucial for conservation and management of forest genetic resources. Forest management practices based on selective and clear cut systems followed by natural or artificial regeneration can impact population structure and mating patterns, thus gene flow and genetic diversity. Survival and productivity of both tree and non-tree species can be compromised or, possibly, enhanced. The extent of genetic impacts depend on the management system applied, stand structure as well as species’ distribution, demography, biological attributes and ecology. The impact of management practices is reviewed and synthesized for temperate, boreal and tropical forests based on experimental and simulation studies. In addition, the effects of genetically improved planting materials and establishment of large scale plantations on natural forests are examined. 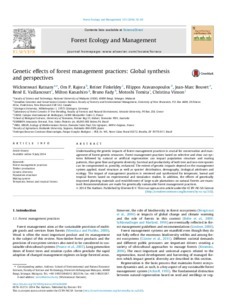 Recommendations are made for genetically sustainable forest management practices.